Since I am not wearing any fake nails right now and my natural nails are short I wanted to try a nail care product which helps nails grow. 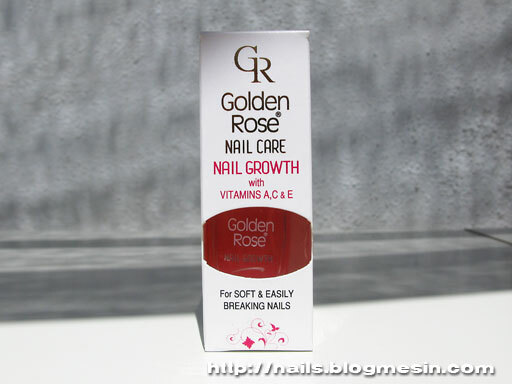 I decided to try Golden Rose Nail Growth. 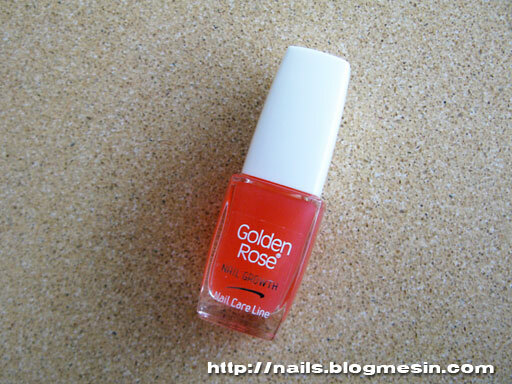 I never used any products from this Nail Care line, so I don’t know if it’s good or not, but I like other Golden Rose cosmetics. In the bottle it’s orange jelly (or more like salmon pink jelly) colour. I was wondering how it looks on nails. 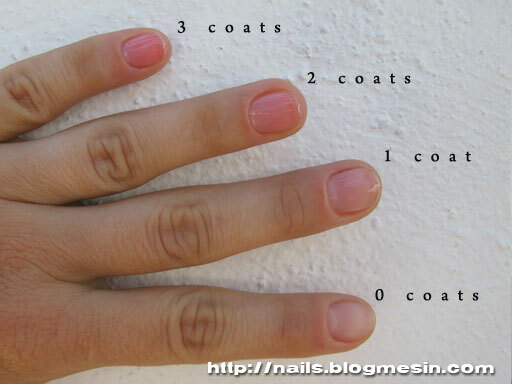 The instructions suggest to apply one coat as a base coat or two coats for a natural nail make-up. Since they don’t write anything about how long should I use this conditioner to see visible results, using it as a base coat under regular nail polish seems like a good idea. So here are the swatches of Nail Growth on my nails. One coat gives nearly no colour at all. Just adds shininess to the natural nails. Two coats give a nice transparent colour. I must say that it really looks good. I also applied a third coat, but it didn’t give much stronger colour and this last layer was drying reallllly long. I think two coats are good choice if you don’t want to apply any nail polish on the top. I was wearing two coats on my nails for one day making all the usual housekeeping like washing the dishes and so on and it stayed on the nails. No chipping, peeling or cracking. I would say that its duration on the nails is actually pretty good. How many times did you return from a beauty supply shop with a nail file that is simply bad? It’s to rough or it doesn’t file your nails at all. Well maybe it’s becouse it’s not nail file suitable for your needs. Here is a simple guide to some common types of nail files. nails. Good things about metal nail files are that they are long lasting and easy to clean. On the other hand they can cause allergies to people allergic to some types of metal. If you want to buy a good one, look if it’s not too rough because this type of nail file often causes splintering and chipping of the nail edges. When water gets into cracks in the nail ending its slowly destroying the nail and after a while you can see that your nails are in a bad shape. 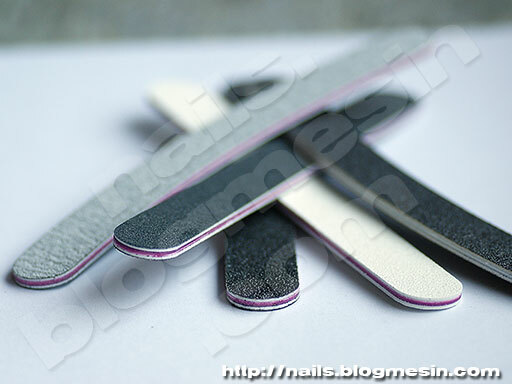 Metal nail files are recommended for those whose nails are strong and hard. 80 grit – sharp and very rough, used for removing outer gel or acrylic overlays. It’s too rough for natural nails. 180 grit – medium sharp and medium rough, used for preparing nail plate before applying gel or acryl and for shaping artificial nails. 240 grit – not so sharp and rough, for final filing artificial nails. This grit can be used for filing natural nails. You can find emery boards with another grit like 100, 120, 150 and so on, but really don’t go under 180 if you want it for your natural nails. If you cannot decide what grit is best for you, buy emery board with different grit from two sides f.e. 180/240 means that file will be medium sharp from one side and mild from second. If you want to remove your gel or acrylic nails and you don’t know how to do it just go to a nail saloon instead filing them off. If you will do it by yourself you may damage your natural nails or cuticles. Emery boards are available in many shapes. 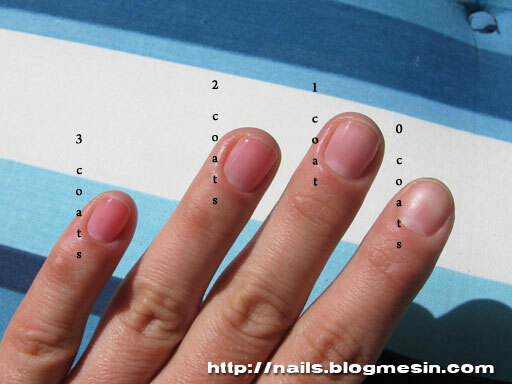 If you want to use them for natural nails the best choice will be simple a straight one. Other shapes are mostly for working with artificial nails. For example bended ones are excellent for filling, those with square edges can reach every place on the nail plate. You can find also cute emery boards shaped like fruits, flowers, cakes and so on. They are not so good to use so I treat them more like sweet gadgets which I can always have in my purse. They are very fine. 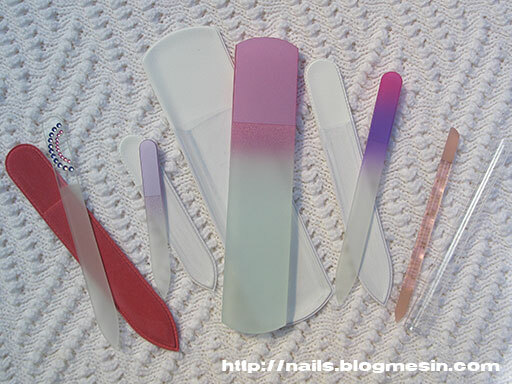 Glass nail files sometimes have bad reputation because many people don’t know for what these files are acually are. Use them after cutting nails or using more rough files. Glass nail files will smooth the edge of a nail and ‘close’ it so there will be no splintering or chipping and water will not destroy the edge of a nail. 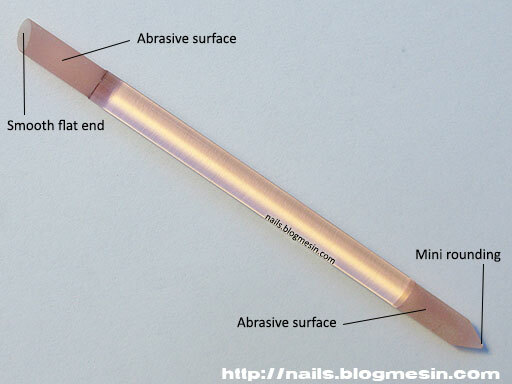 Glass nail files are easy to clean so they are higienic and they don’t cause alleries like metal nail files can. 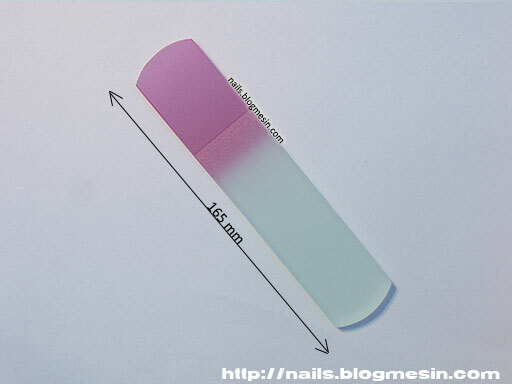 Main disadvantage of glass nail files is that they are easy to breake. You can find them in different colors so sometimes they looks very cute. 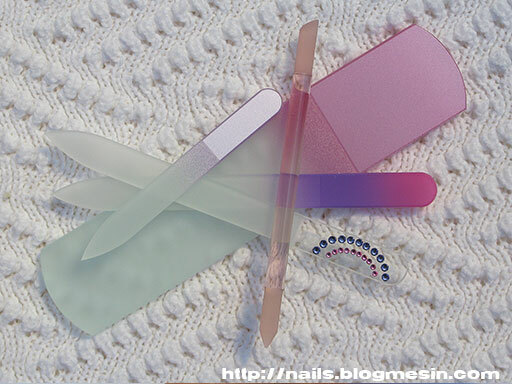 Glass nail files are very good for thouse who have delicate, not so strong and easy to break nails. They often have different roughness from opposite sides. One side is for filing the nail, second for smoothing it so you don’t need to purchase two different files to make your manicure. 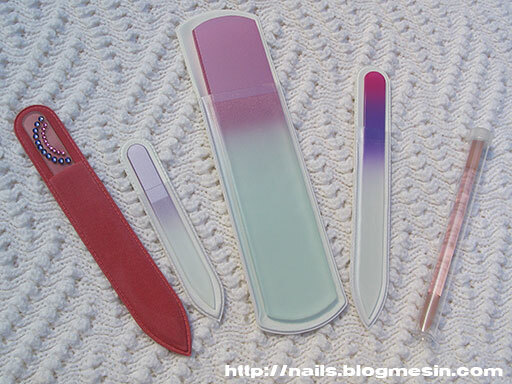 Ceramic nail files are easy to clean and long lasting. They don’t couse allergies like metal nail files can. Cuticle oil is a moisturizer for nails and cuticles. It have in components different oils like avocado oil, grapeseeds oil, almond oil, jojoba. It often contains vitamins usually vitamin E.
Why use it? Already after one application cuticles looks better, they are softer and moisture. I recommend it for thouse who have problems with biting or pulling sticking out dry skin. After a regular use nails starts to grow faster, they are stronger and more flexible. Using cuticle oils is good after applying or removing artificial nails. During those processes cuticles can be little bit damaged by nail filing and products used for preparing natural nails uder gel or acryl. By applying oil nails very quickly comming back to good shape . Cuticle oil helps also with maintaining nails at home. If you suffer from overgrown cuticles, soften them with oil and then you can easily push them back with orange stick. Remember just to do it gentle and never use sharp objects to push cuticles. Moisture nails are also easier to cut. Never use oil before painting nails or before applying artificial nails. It will couse nail polish, acryl or gel lifting. Always apply it after. Commercial cuticle oils differs a lot. Bottles often comes with little brushes. They looks like nail polish bottles. They are really easy to use. There are also oils available in pens. They are very good when you want to have them in your bag and apply during the day. They are small, light and will not spill inside your purse. You can also purchase bottles with droppers. Thet are available usually with big bottles used in salons where hygiene is veryimportant. Dropper never touch the finger so there is no warry that some particles will end up in oil bottle. Using cuticle oil is very simple. Just pour a drop of oil on cuticles or paint cuticles with a brush or pen and then rub it in. Don’t use to much becouse it will not soak in and you will have greasy fingers. If you feel that your cuticles need a special treat just apply a little bit more of oil and leave it for the night. The really lovely thing about cuticle oils is that they smells gorgeous. You can find them with fruit, flowery, candy and many more scents. They also have cute bottles with funny colours. Sometimes producers put inside coloured dried flowers or tiny sea shells so using it is really nice. can also make moisturizing bath for your cutticles at home from olive oil. Just pour a little bit of oil into a bowl and dip your fingertips in this bath for 10 to 15 minutes. It’s better when oil is warm (but not hot!) becouse it better soaks in. 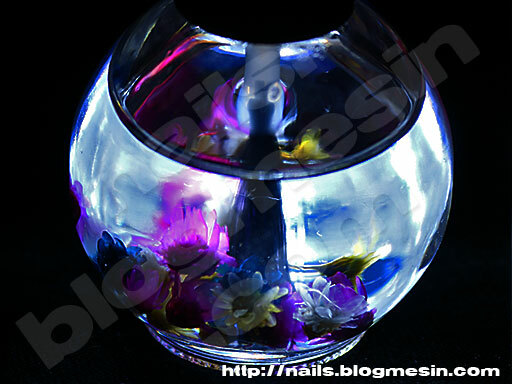 Use cuticle oil regulary and you will very fast see the diference in a shape of your nails.